1974 Laverda SF2 750 twin. Basket case. Its what I live for. My favorite thing to do is sort out the parts and piece them back together. Some bikes take 2 weeks, some bikes take 5 years (like this one). 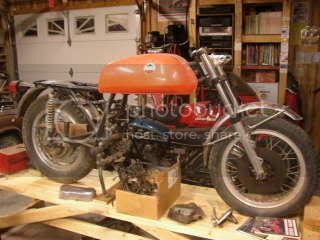 I might get more done if I didnt keep buying these old barn bikes. yep I know what you mean. Isn't there a 12 step program that deals with this? If there is, I hope its all garage time. You have a good starting point with the Lav. I have taken a fair while on the one below and it is nearly finished. Best of luck. You guys have far too much time on your hands, obviously no kids, single, or a wife that knows how to be thrifty (mine needs lessons), no lawns to mow, the cars must be maintenance free, and absolutely NO social life.........my GT is sitting there, needs plenty of finishing off, but road worthy & registered, and i haven't even been for a ride in 5 months!! when can I go for a ride please dear? Good grief Steve, I almost soiled myself. Very impressive! Surely thats not been ridden. I dont see any exhaust blueing. Beautiful bike! Hey Rick, welcome to the 12 step Italian motorcycle obsession program. Im still in denial on step 1 because I'll buy just about anything with 2 wheels and I think it may be a more serious "disease". (Disease in America means funding. [cha-ching!]) Our new friend Steve here had to start all over because he started calling machines "his children". (See picture above). As for me? Married 25 years, we have a 22 yr old daughter who insisted she had to move out when she turned 18 (ok, if you must) she now works with me at the Railroad in the same building, and an 18 yr old son who doesnt see the importance in finishing high school and just wants to work at the auto parts store for the rest of his life (his mothers influence probably. Ok, its mine, I told you Im in denial). I think hes going to finish though. Threats, bribes and intimidation and telling him hes going to be driving a Honda Civic the rest of his life seems to be working. Ive been this way since I was 14, so my wife knew what she was getting into before we got married and even lets me talk about motorcycles with her sometimes. In return, I act interested in her quilting obsession. I also let her map out quilting shops on our road trips to swap meets and bike shows. Its a give/give relationship. You're right about the rest. No lawn to tend to (I live out in the country with no neighbors), newer cars, my wife and I ride the motorcycle together to work in the warmer months (theres that thrifty part) and you hit the nail on the head about NO social life. Look at me! 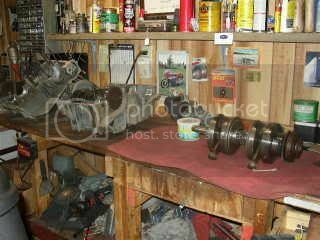 I spend all my free time in the garage and on the computer! Rick, Do what I did. On mothers day present your wife with her very own riding mower.Tell her she doesn't have to share it with anyone! Then the next year give her a pink gas can to to use only for her very own mower.You too can join the ranks of the truly romantic husbands club. Also tell her you will work on it if you have time between restorations. 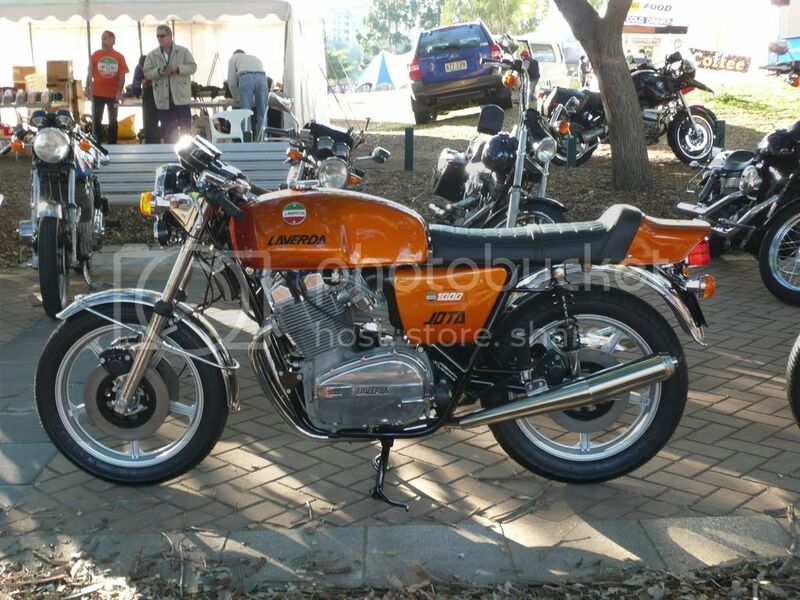 I just realized Steve didnt post the beautifully restored Laverda above. Nice bike MacDesmo! I have never been accused of being the sharpest knife in the drawer. Slarsonroy wrote: I just realized Steve didnt post the beautifully restored Laverda above. Nice bike MacDesmo! I think I just sold you some old Monza toolboxes? Yep you sure did. Got them the other day and they are better than in the pics. Should work just fine on my 350. Im slowly buying missing parts. Just got a set of stainless engine bolts, still need a set of front engine mounts for it.